ID Tech offers a wide variety of Magnetic Stripe Cards or Mag Stripe cards as they are commonly referred to. We sell both Lo-Co (low - coercivity ) cards and Hi-Co ( high - coercivity ) range of magnetic cards with standard track1, track 2 and track 3. We are the only company in India that has multiple colour options for Magstripe. We have magstripes in Silver, Gold, Red , Green, Black and blue colours. ID Tech is one of the major manufacturers and suppliers of high quality Mag stripe cards in New Delhi, India. 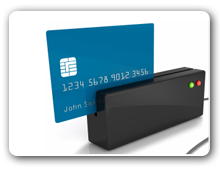 Most companies that are using magstripe cards complaint that the cards do not work after a couple of swipes. However we guarantee 10,000 swipes on our cards.